While living on the Eastern Shore of Maryland I saw plenty of shiny new yachts. Most were kept in resort town marinas and saw, at best, occasional use by their absentee owners. They were pretty boats, to be sure: freshly varnished teak and pure white paint. After a few arrivals and departures from a sandy beach, this is what my canoe looks like underneath. But the boats that most captured my imagination were the old wooden workboats—the fishing and crabbing boats that were built from thick timbers by old-time craftsman who took their skills for granted. Most were scuffed, scraped, splintered, and hastily repaired. They exuded a strong odor of dead fish and dried mud on hot summer days. But after decades of hard work, they exhibited a depth of character that no weekend yacht could emulate. Like a crumbling stone wall in an abandoned farm field, they became part of their environment. They blended harmoniously into the salt marsh landscape of the Bay precisely because they were rough hewn and hard used. Every well used canoe needs some mud. Still, part of me wondered if I would regret my hasty approach. Once I was on the water and my boat was exposed to the revealing glare of sunlight on water, would I wish for greater perfection? Maybe I would feel embarrassed by my humble work whenever a gleaming yacht slid passed. But I recently had a revelation about this urge for workshop perfection. A few days ago I took my canoe—the “six hour” canoe I built last fall—to a local lake for its first outing of the season. This was only its second trip to the water and I doubt its total use by the family exceeded an hour or two hours of paddling. But by the end of the day, as I lifted it out of the water and hoisted it back onto the roof of my car, I immediately noticed that this new, barely used craft was coated in mud. 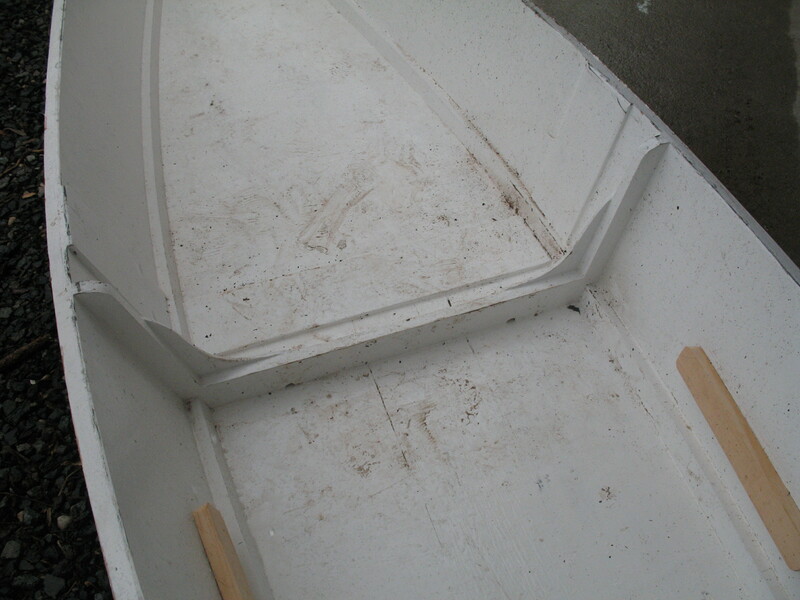 Underneath, the paint had scraped off down to bare wood and fiberglass where the canoe dragged along the shoreline. 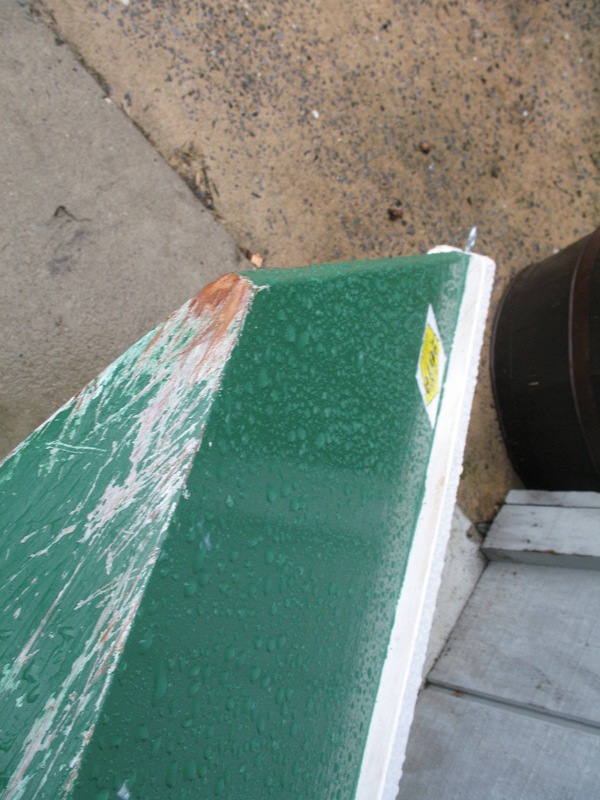 A quick once over with a hose and a touch up with a paint brush would make the canoe nearly good as new. But why fret about this “damage”? The canoe was just being used as a canoe should; the mud and scratches are badges of honor. And I’d rather enjoy my canoe than worry about every little ding. Instead, I found myself feeling smug that I didn’t waste my time sanding and painting. Why pursue a notion of perfection that cannot be sustained in the real world? Back home, my Pocket Cruiser has yet to see the water; it has yet to see sunlight or rain. It has not yet hit a gravely beach, or hosted children with muddy feet who spill their drinks. It has not yet hit a dock—hard. But it will and, when it does, my brightwork won’t look so bright, the white paint will show dirt, the paint will scrape away and begin to bubble. As I begin my third spring as a novice boat builder, I’m starting to realize how fully my enthusiasm is shaped by the seasons. Winter is a time for second guesses and self recrimination. What, I wonder, have I gotten myself into? Who cares about boats? Midlife insanity must be the only explanation. 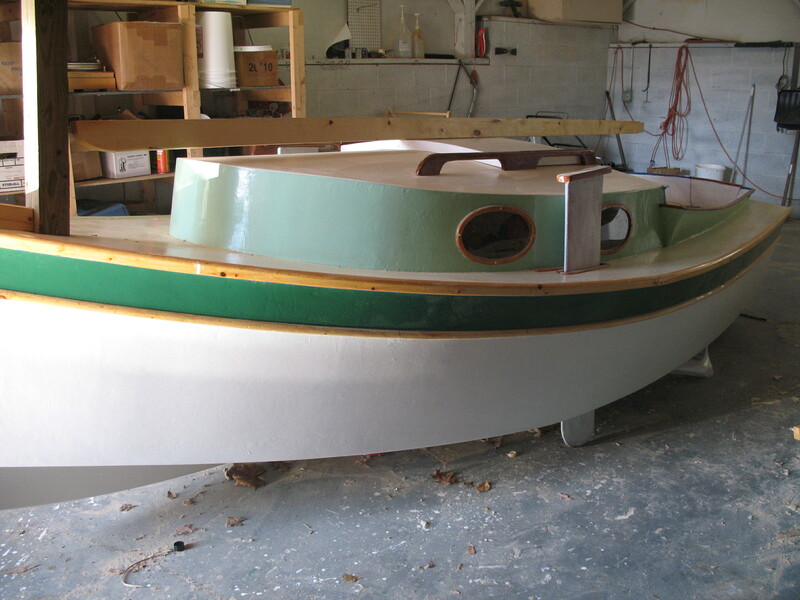 But as soon as the air warms and the grass starts to turn green, I find myself irresistably drawn to boat building web sites and, as predictable as crocuses, I feel the tug of the boat itself, pulling me out to the garage and compelling me to pick up my tools. Within hours, I am once again dreaming of my long-planned trip down the Chesapeake. Two days of sun and mild temperatures worked their magic and the result was a trip to the hardware store and a full afternoon of work. But before I begin another season of blog posts, I thought I should post a few photos showing what the boat looks like just before I get down to work. In the coming weeks, if possible, I plan to finish painting the cockpit, make the polytarp sail, install the mast, and attaching all of the many lines and pulleys that will hold it all together. 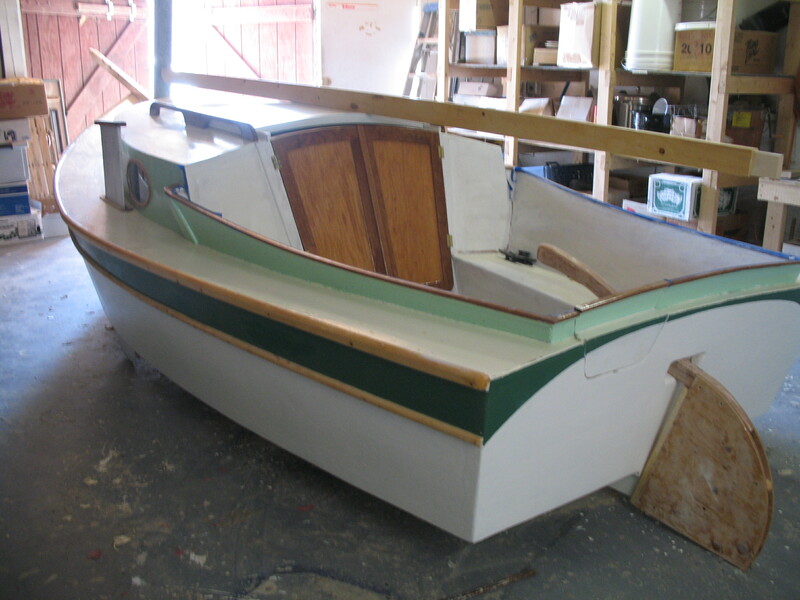 You are currently browsing the Build a Boat, Sail Away blog archives for April, 2011.